Jeans, cute shoes and a cold diet coke. This is how Bound throws together button down sweaters and an inexpensive garage sale find. You can take the jeans out of the country but you can’t take the country out of the jeans. In my quirky way this translates to jeans are a staple clothing item. They are like close friends. They keep their undertones to themselves, forgiving, present when you need them and go with the flow. Although my closet hosts many pairs of jeans there are just a few favorites that rotate on the very top of like 25 pairs – no joke and I may need counseling. 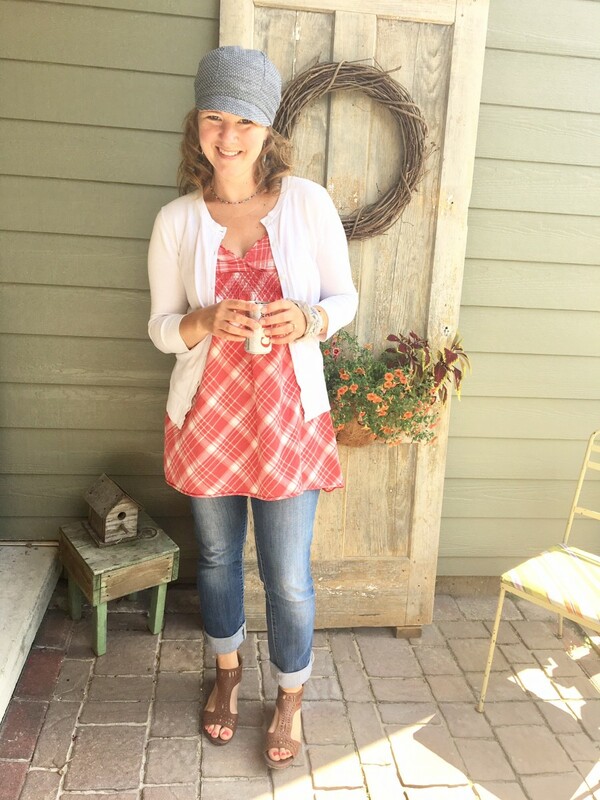 Way back when, I used to pack away the jeans for summer and then I had a total “grown-up” moment when I realized I didn’t have to pack them away anymore – Aha! 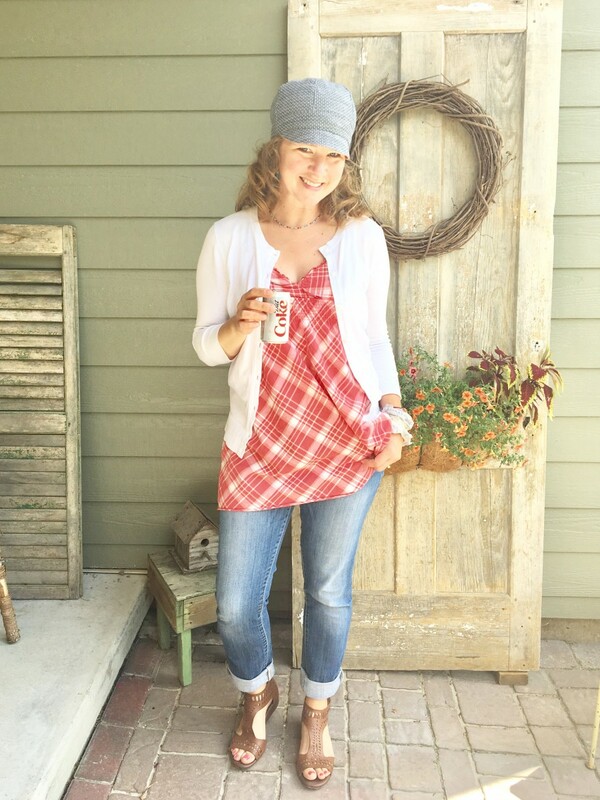 You can get this look without this plaid top my friends – throw on an over-sized ripped T-shirt or plaid button down lurking behind the “usuals” in your closet. If the shirts are too long cinch the hip side with a knot – VOILA! you got style girl! 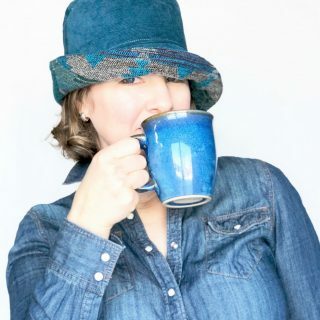 Yes, this is the same handmade hat that gets wear after wear! The mini-print pattern is cute enough to make a statement and also compliments the rest of the outfit. Because of its neutral linen-blend material it is a timeless hat. A timeless hat with personality and diversity gets years of wear! 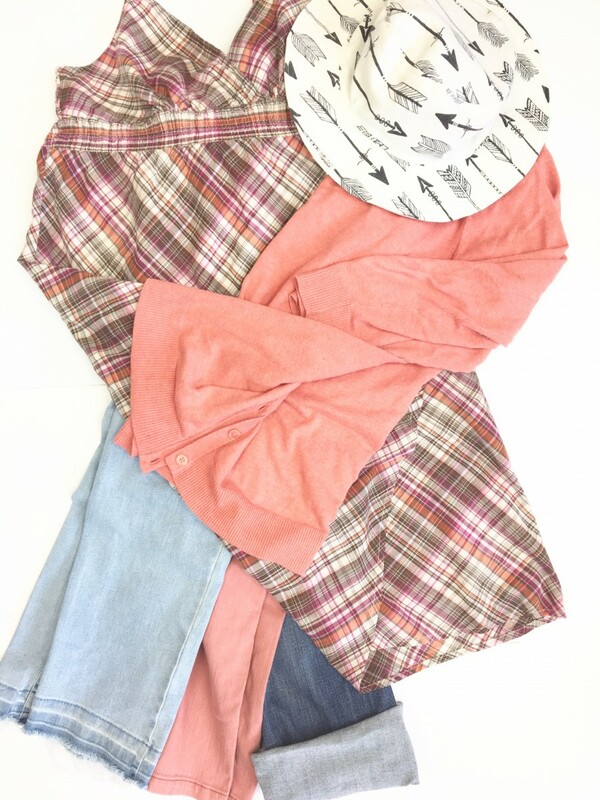 The faded orange plaid top was a garage sale score for about $3. I’m very in love with this top. It cover’s enough of the junk (saggy backside and kissing thighs) that some of us women want to hide. 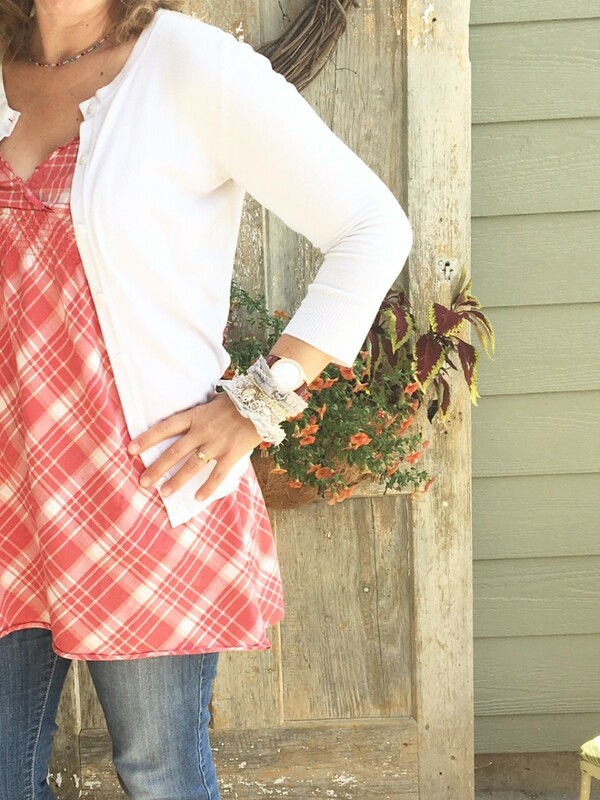 The top flows past the hips to the just-right length and what’s not to love about those diagonal plaids! The rolled hem on the bottom has seen some wear and tear, but it’s minimal. The hidden spaghetti straps are adjustable and rarely are seen when I wear it. Oh and there’s matted, but dainty ruffles on the neck line. What can I say, I love details and enough already about my love affair with this top. Point is that I really like this look and I’m super happy that this plaid top wasn’t the happy-dance for someone else anymore. Ever wanted to be a hat person? 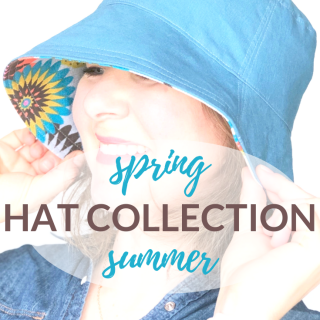 Discover your inner hat wearing confidence by joining my mailing list and get an exclusive email bonus series on How to be A Hat Person! Sign up here! The concept of mixing patterns is wonderful and the key is to tone down the patterns with a buffer. In the above photo the buffer is the orange-y sweater. 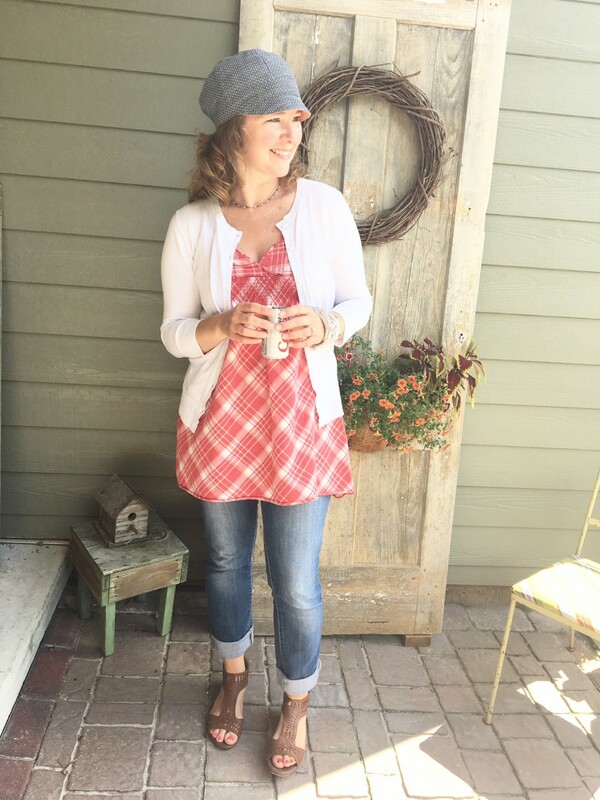 This bucket arrow hat and plaid top scream summer fun, but the light weight button down sweater is handy to offset the fashion fight going on between the hat and dress. Throw on a favorite pair of jeans underneath and BOOM! you’re on your way my friend. 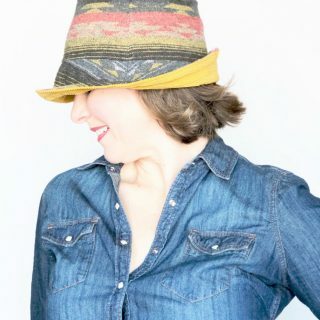 Now, I would steer clear from wearing the orange-y sweater with the cute orange-y jeans – I would ditch the sweater and grab a different neutral hat and head out to my local farmers market bare shoulders and all. Do you have a nagging question about an outfit that is 50 cents short of being totally awesome on you? 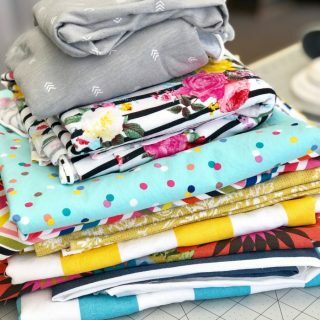 Are some of your favorite clothing items waiting patiently to be noticed for more than just a “cute shirt”? I’m no fashion goddess, but I’d like to help you out with your questions! Send me an email (for my eyes only). and nudge you to feel confidently cute!